Although many efficient bond-forming reactions have been developed in the field of synthetic organic chemistry, their utility typically fails to translate in complex mixtures present in cellular or living biosystems. As such, only a handful of effective labeling or conjugation methods in biosystems are readily available. To address this issue, we are synthetically exploring the unique reactivity of conjugated imines for their potential in novel chemical reactions. The benefit of this approach is that since a large part of amine-containing biomacromolecules are biosynthesized through imine chemistry, imine-mediated chemical reactions will not face the same challenges that classical synthetic organic chemical reactions face within living systems. In parallel to this work, our studies have also shown that the unique reactivity of imines could be involved in pathways that regulate biologically important processes. Besides usage in methods of labeling or conjugation, the novel reactivity of imines could alternatively be used in the multi-step synthesis of biofunctional molecules within living biosystems. Through a concept we refer to as “Therapeutic In Vivo Synthetic Chemistry”, we aim to develop an adaptable system where a cascade of organic transformations can be directly executed at target regions within the body during predefined times to generate a bioactive molecule that elicits a localized biological effect. Towards this goal, we are analyzing, with the use of molecular imaging, the complex “pattern recognition” mechanisms of natural glycans in vivo and applying the glycan-based interactions to direct various linked biomolecules to desired organs and tissues. We have discovered that N-alkyl conjugated imines, derived from natural alkanolamines and diamines can participate in [4+2], [4+4], or [4+2+2] cycloadditions. Further studies have demonstrated that neighboring hydroxyl or amino groups of the conjugated imines significantly contributes to the acceleration of these cycloadditions. These reactions were subsequently applied in the stereoselective, one-pot synthesis of chiral diamine derivatives, thereby establishing their promise as an effective method to synthesize bioactive molecules via [4+2], [4+4], or [4+2+2] cycloaddition reactions. We are also applying these products as new catalysts of innovative organic transformations. This work is being performed in collaboration with A. Butlerov Institute of Chemistry, Kazan Federal University (Russia) and Graduate School of Fisheries Science and Environmental Studies, Nagasaki University. In addition to elucidating the novel reactivity of conjugated imines, we discovered that their unexplored reactivity could also regulate biofunctional processes. One such example currently being explored is a formal [4+4] cycloaddition reaction between conjugated imines (derived from polyamines) and the toxin acrolein (derived from enzyme-catalyzed oxidation of polyamines) to generate eight-membered 1,5-diazacyclooctane derivatives. Although the formation of diazacyclooctanes neutralizes the toxin acrolein, our studies have shown that the resultant diazacyclooctane hydrogel, which is produced under oxidative stress conditions, further accelerates the oxidative stress process. From reactivity profiles studies of the unsaturated imines, we conclude that the polyamines are in constant dynamic structural change mediated by amine oxidase. On the other hand, we hypothesize that monomeric 1,5-diazacyclooctane may be involved with regulating cell division, transcriptional activity, and/or amyloid accumulation. Further investigations of the regulation mechanisms caused by the reactivity of the polyamine-derived imines are currently underway with the use of isotope labeled NMR spectroscopy and by various molecular biology techniques. 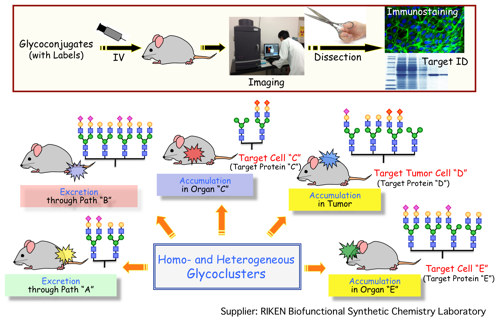 This work is being performed in collaboration with the Systems Glycobiology Research Group, RIKEN-Max Planck Joint Research Center for Systems Chemical Biology, Global Research Cluster, RIKEN, Bioengineering Laboratory,, RIKEN, Chemical Genetics Laboratory, RIKEN, the Graduate School of Pharmaceutical Sciences, Kyoto University, and the Faculty of Science and Technology, Waseda University. Despite only a few previous reports having investigated post-translational protein modification of arginine, we were inspired by a rather rare example involving lipid metabolites. As a consequence, we have developed a novel, one-pot chemical reaction, which operates through multiple transformations starting from simple starting materials, to produce 2-aminoimidazole derivatives. This reaction is dependent on the reactivity of conjugated imines derived from guanidine substituents. Application of this chemical reaction has lead to the successful synthesis of the first library of 2-aminoimidazole derivatives, which includes the promising anti-angiogenic, alkaloid natural product, ageladine A. This promising one-pot synthesis of 2-aminoimidazole derivatives has established the basis for future work, which may include (i) medicinal chemistry studies to identify pharmaceutical candidates with potent anti-angiogenic activity; (ii) selective biolabeling studies for the less-reactive arginine residues in/on live cells; or (iii) synthesis of the bioactive natural products on target proteins in living biosystems. In parallel to this work, we have also developed a novel method of Lewis acid-catalyzed guanidination of amino groups by cyanamide in water. These studies are being performed in collaboration with the Faculty of Science and Technology, Waseda University and the Department of Chemistry, Graduate School of Science, Osaka University. Previous studies of marine natural products and their enzyme inhibitory mechanisms lead us to the discovery and development of an efficient labeling method selective for amino groups present on biomolecules and the surface of live cells. This method, which is dependent on a rapid 6π-azaelectrocyclization of conjugated imines, has shown a wide range of utility such as its use with noninvasive PET imaging. We improved upon the labeling method though incorporation of positron emitter metal/ligand complexes, which are readily applicable to a variety of biomolecules, as well as to whole live-cell based PET imaging. This improved method could potentially be used for future diagnosis and protein- or cell-based drug discovery. An efficient bioconjugation method was also developed using the principles of the azaelectrocyclization-based labeling technique. With the use of a dialdehyde probe, two amino groups of biomolecules can be linked. As such, biofunctional molecules such as peptides, glycopeptides, and fluorophores can be efficiently introduced onto the surface of proteins and live cells. These studies are being performed in collaboration with Center for Life Science Technologies (CLST), RIKEN, Systems Glycobiology Research Group, RIKEN-Max Planck Joint Research Center for Systems Chemical Biology, Global Research Cluster, RIKEN, A. Butlerov Institute of Chemistry, Kazan Federal University, Synthetic Organic Chemistry Laboratory, RIKEN, Institute of Biomaterials and Bioengineerings, Tokyo Medical and Dental University, and Center for Integrative Medical Sciences (IMS) RIKEN. One of the hurdles that prevent protein therapeutics from greater clinical usage is the lack of a general organ-selective biotargeting system, as well as greater control over excretion profiles. One approach to address this issue is to utilize glycans to direct protein accumulation in specific organs. Our research has introduced various glycan structures onto specific cells or artificial dendrons, through the 6π-azaelectrocyclization protocols described above, as a means to investigate “homogeneous” and “heterogeneous” glycocluster dependence on in vivo dynamics. 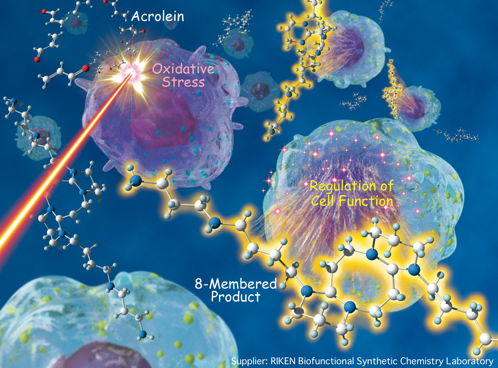 Through the use of molecular imaging, results have shown that glycan composition on cell or dendron templates can directly control accumulation towards specific organ and tumor cells, as well as affect their excretion profiles. We are now applying these glycoconjugates not only to PET and MRI diagnosis, but also to therapeutics, by using newly emerging techniques. 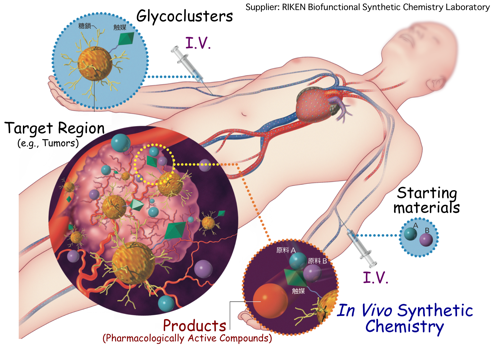 This work is being performed in collaboration with CLST, RIKEN, A. Butlerov Institute of Chemistry, Institute of Physics, and Institute of Fundamental Medicine and Biology, Kazan Federal University and Systems Glycobiology Research Group, RIKEN-Max Planck Joint Research Center for Systems Chemical Biology, and the Global Research Cluster, RIKEN. Individual interaction of the single molecule of glycans is very weak. Including our research project discussed above, the glycans are generally clustered to enhance and mimick the glycan interaction in nature, i.e., multivalency effects and pattern recognition. On the other hand, we are developing a totally new concept for selective targeting in live system, by making advantage of the “weak interaction” of the glycans. More specifically, (1) “strong interaction” of protein or peptide molecules, (2) “weak interaction” of the glycans, and (3) selective bond-forming reactions, will simultaneously and synergistically be worked to achieve the selective recognition in live cells and animals. This work has been performed in collaboration with CLST, RIKEN and Systems Glycobiology Research Group, RIKEN-Max Planck Joint Research Center for Systems Chemical Biology, Global Research Cluster, RIKEN. Through the amalgamation of all research areas actively pursued in our lab, we are ultimately challenging to develop a model system where bioactive compounds can be synthesized within living animals, which we refer to as “Therapeutic In Vivo Synthetic Chemistry”. The main benefit of this approach is that a cascade of organic transformations can be directly executed at target regions within the body during predefined times to generate a bioactive molecule that elicits a localized biological effect. This method entirely circumvents the off-target and peptide instability problems associated with the currently applied drugs. We will soon be reporting an example of an organic transformation on the surface of live cells and in animals, which will be the first example of in vivo multi-step synthesis. This work has been performed in collaboration with CLST, RIKEN and Systems Glycobiology Research Group, RIKEN-Max Planck Joint Research Center for Systems Chemical Biology, Global Research Cluster, RIKEN, and the Department of Chemistry, University of Basel. These researches have also led us to discover that simple functional groups, which are regularly used for organic synthesis, exhibit previously unrecognized reactivity in living biosystems. As such, we hope to exploit their reactivity to develop an assay for the sensitive detection and regulation of important biomolecules implicated in various disease states. To accomplish this, rather than use “molecular recognition” probes (e.g. antibodies or artificial synthetic receptors), our detection and regulation strategy will instead pursue a novel approach that will be driven by the “unexpected” and “unexplored” chemoselectivity of synthetic organic chemical reactions. This work has been performed in collaboration with CLST, RIKEN and Systems Glycobiology Research Group, RIKEN-Max Planck Joint Research Center for Systems Chemical Biology, Global Research Cluster, RIKEN, and A. Butlerov Institute of Chemistry, Kazan Federal University.